My whole family loves a tasty dip. It’s a great way to boost your vegetable intake – carrot sticks taste a whole lot yummier with something to dip them in. This nut free dip is great in lunch boxes or for afternoon tea for the kids and even fancy enough to take to a barbecue. In fact, I always get asked for my recipe when I make this! As well as serving the dip with plenty of fresh veggies, I also like to ‘upnourish’ as Kristin from Mamacino says, with extra vegetables and veggie powder added in. 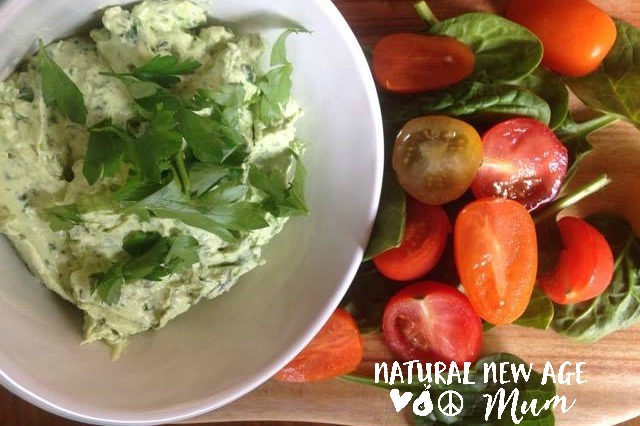 This green dip is also so much cheaper to make than buying a pre-made dip from the supermarket. Seriously how expensive and full of additives is dip these days! Even the ones in the gourmet delis are full of canola oil and will set you back the best part of $10! Anyhow…. here is the recipe. Let me know if you make it and what you think! Wash all your greens well. Chop the shallots into a few pieces. In your food processor or thermomix, throw the garlic and greens and whizz up. Scrape down and add the remaining ingredients. I don’t mind mine a bit chunky but if you have fussy kids, keep blending! This is a spreadable, thick dip. If you want something softer and dippier (yep that’s a word), add a tablespoon or so of yoghurt or sour cream. Serve it with plenty of cut up veggies and some seed crackers. It will last around three days in a well-sealed container in the fridge. Hot tip: If you want to go really hard-core, have a crack at making your own raw cream cheese. Do you think this would freeze well? Looks super yummo!